The US Supreme Court has just issued a ruling to allow gay marriage across the country. This is a deeply divisive issue, with many passionately for or against, and many who simply don’t care. “I have family to feed, children to send to college, I am not gay and I am not religious, why the hell do I care?” You are missing the point. This gay marriage issue, which many Asian Americans don’t care, is intimately linked to another, the college admissions issue, which many Asian Americans do care. The linkage is how the American judicial system operates and what you can do to influence the outcome. The gay marriage case highlight the power of consistent effort by a social group to effect change in the society, whether you like it or not, and the fact that the ultimate arbitrator of such a divisive issue is the 9 Justices siting on the Supreme Court bench. This case may not be of interest to many Asian Americans, however, other topics pertinent to Asian American communities, such as the legality of racial preferences in college admissions, and the legality of SCA5 type legislation, will be decided in similar fashion. The composition of the Justices on the Supreme Court plays a pivotal role in deciding cases, because their opinions are shaped by their life experiences and deep-rooted value systems. Each Justice is a lifetime appointee by the sitting US president, typically will influence to the bench over a 20-30 period. A US president will ONLY appoint Justices who share his own ideology. If you look back to the last 30 years, a Democratic president will only appoint liberal Justices (Kagan & Sotomayor by President Obama, Breyer & Ginsburg by President Clinton), who as expected, always support racial preferences in college admissions. A Republican president will only appoint conservative Justices (Alito & Roberts by President Bush Jr., Thomas by President Bush Sr.), who as expected, always oppose racial preferences in college admissions. There has been NO exception to this rule. With the increasingly acrimonious nature of partisan politics, hoping the next US president will break this pattern is nothing more than wishful thinking. Hope is NOT a strategy. On the contrary, YOU are in the driver seat. YOU can decide who is the next US president in 2016, thereby deciding the next Supreme Court Justice appointee who will be replacing (liberal) Justice Ginsburg when she retires. 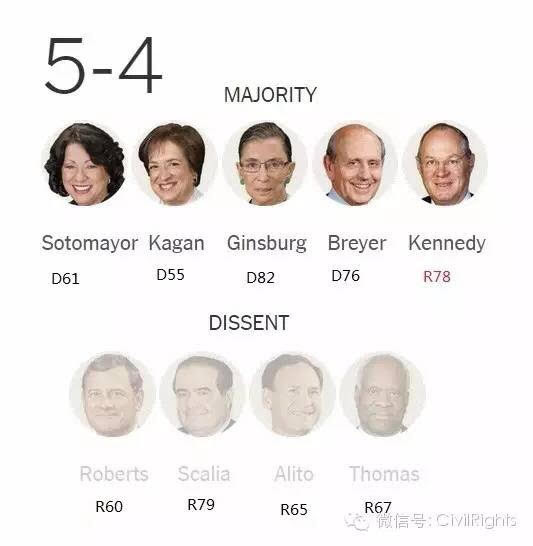 As of now, any Supreme Court up-down vote on the legality of racial preferences in college admissions will produce either a 5:4 or 4:5 vote, because Justice Kennedy can vote either way, whereas all others have long decided by a 4:4 tie. (Note the 6:2 vote on Fisher vs. University of Texas at Austin is NOT an exception to this rule, because the 8 Justices simply to decide to postpone the decision with a compromised voice of concern on how racial preferences could be practiced before a decision is made, whereas Justice Kagan excused herself for her role in advocating FOR racial preferences on behalf of the Obama administration as the Solicitor General prior to her SC appointment.). If the next US president is a Republican, the next SC appointee will tilt the SC voting pattern to 6:3 or 5:4, either way, a SCA5 equivalent racial preferences legislation will be overturned even if it passes the California chambers. If the next US president is a Democrat, the next SC appointee will set the SC voting pattern unchanged at to 5:4 or 4:5 (if Ginsburg’s retirement creates the vacancy, otherwise even the first appointee could decisively shift the Court to the left, a much worse scenario that can happen), while the second appointee will tilt the composition to 4:5 or 3:6. By then, just forget about any SCA5 fight, just forget about any legal challenge to racial preferences, just forget about any DOE petition (even if the administration is Republican, currently it is not. The DOE under Obama will just sit on your College Admissions petition forever and do nothing). Our chance to overturn racial preferences bills will be indefinitely delayed, most likely for a whole generation. Forget about your children, perhaps your grandchildren still have some hope. Can you afford to sit, wait and do nothing? Please apply for US citizenship now and register to vote in 2016 and encourage all your friends to do so. Please also help persuade your friends to add their e-mails to our list so that we can collectively work toward the common goal. YOU must be the change in the world you want to see. Together, we shall overcome.